HYDRO_BOT is now on both Facebook and Linkedin. In addition to being present on social media platforms, participation at ISPO resulted in almost 50 articles in newspapers and journals: both commercial papers like Daily Mail and from sources more specialized on for example textile. 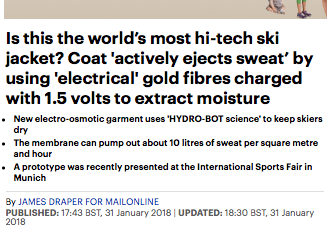 The large amount of media coverage included Daily Mail claiming a ski jacket with the HYDRO_BOT technology integrated is the most high-tech in the world. The Austrian newspaper Der Standard writes about the ski jacket that disposes sweat by actively transferring moisture from the upper body micro-management to the outside. In the lab, the HYDRO_BOT technology has shown a transportation of 200l per m2 per hour. Although one could only sweat up to one litre per hour on the upper body alone, the lab result proves that the technology easily can match human sweat rates. Norwegian Teknisk Ukeblad is a tech journal. Their article on HYDRO_BOT naturally focuses more on the more technical side of the technology – explaining the billions of micropumps that moves sweat through panels in the jacket.